There are few features in a car as versatile as the lowly cup holder. Think about everything you've put in yours over the years and name another part of your car that has performed so many functions. And yet, just last month, a Harris poll conducted for Ford revealed that nearly a fifth of all drivers use cup holders for food, and over a quarter use them for... well... quarters. 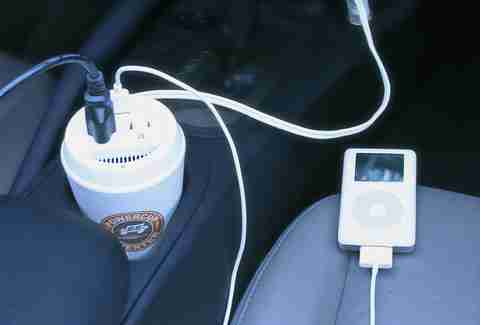 If you're one of these drivers not using your cup holders to their full potential, get creative and try these hacks. While texting drivers have their own circle of hell waiting for them, there are a few perfectly good reasons why you’d want to keep your phone within easy sight, like GPS, or using it as a more complete instrument panel for your car. Finding places to put it on the windshield, where it’s competing with your registration sticker and possibly more, isn’t always the best idea. If you don't already have one, get a phone mount made for your cup holder, so you can keep your phone out of your line of sight. For bonus points, run your power cable from your car’s USB port either behind the dash or under the center console. How to do so depends on your car, but invest a little time, and you won't have to worry about your battery or see unsightly cables. Sooner or later you’re going to get sick, and since you’ve already “called in sick” too much, you’re going to have to head to work. One option is to drive around with snot dripping from your nose, unconsciously wiping it with your hand and then wondering where in the hell you’re going to put it, before invariably finding a discreet place on your car. Or, instead of being a filthy, disgusting person, you can keep Kleenex at the ready to maintain some semblance of civility. Take a box of tissues, cut away the box, and transfer a bunch of them to a paper coffee cup. Pull one from the top, and feed it through a 1in x 1.5in slit in the plastic coffee cup cover. Voila! Instant dispenser. Now, just make sure you have a trash bag somewhere handy or you’re back at square one. Look, if you use your cup holder for, you know, holding your beverage-laden cups, you’re eventually going to have minute spillage issues as you hit potholes and speed bumps. 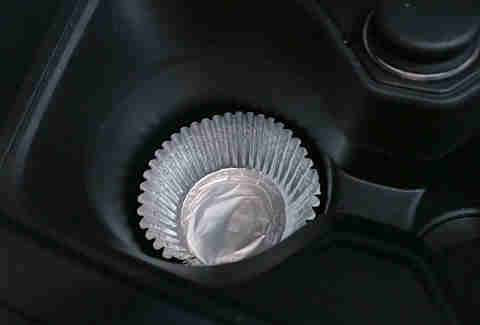 Cleaning out your cup holder is a royal pain, but a cupcake wrapper fits perfectly and catches most of what you spill. 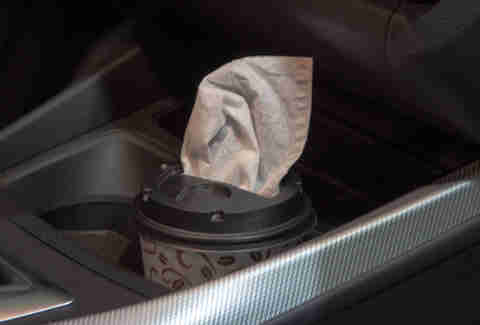 Think of it like a disposable placemat for your car, like those paper tray covers at most fast-food establishments. This isn’t so much a hack as it is a very useful product that you should probably have in your car anyway (cough, if you don't, click here). 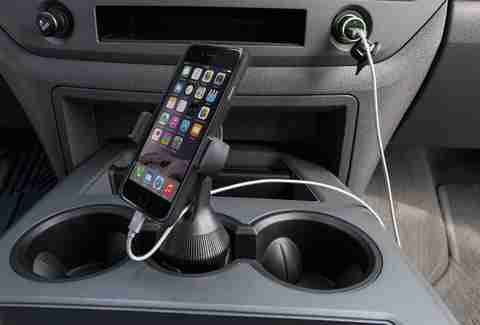 If you ever need to run anything in your car that requires a normal wall outlet, get yourself a cup holder-shaped power inverter that plugs directly into your lighter socket. This is actually pretty cool and can be used for a wide variety of things. It’s really simple, too: grab a foam block from your local arts & crafts-type place -- preferably a circular one that’s about 2in thick, like a good filet mignon -- then use a knife to cut out the shape of whatever you’re trying to fit in there. Keep it nice and tight and presto: your item is secured. 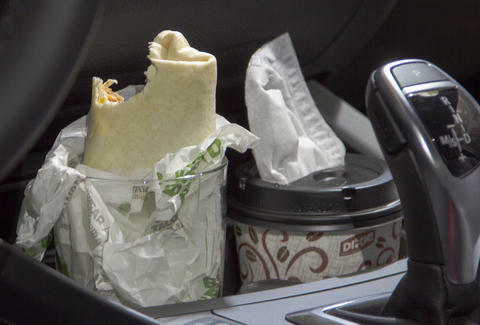 Problem: your burrito is great, but you’re kinda driving and can't put your burrito down anywhere, since you need both hands. 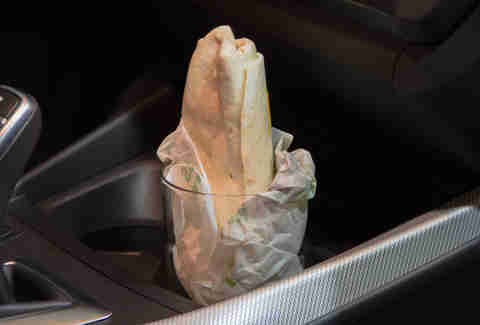 Solution: take a tall glass from home, put it in your cup holder, and you’ve got a freaking burrito holder that'll keep everything intact until you're at a light. Will it work for other tall foods? Probably. You can go ahead and mail me that Nobel Prize for contributions to mobile food technologies now. Aaron Miller is the Cars editor for Thrillist, and can be found on Twitter. His relationship with the ordinary cup holder is surprisingly complicated.